This is the website for a Strathpeffer to Dingwall Community Link. Following the old railway line, this would be a brilliant asset to our community. Over 60 people and a dozen dogs turned out in support of the Strathpeffer to Dingwall Community Link on Saturday 29th August, part of the OURLAND campaign for Scottish land reform. Supporters met at Strathpeffer’s Victorian station to walk along the old railway track, closed since the 1940s, which will form the major part of the link. The intrepid walkers came prepared with step ladders and old carpet to negotiate the barbed wire fences, and garden shears and loppers to clear the path of some of the weeds and dead branches. 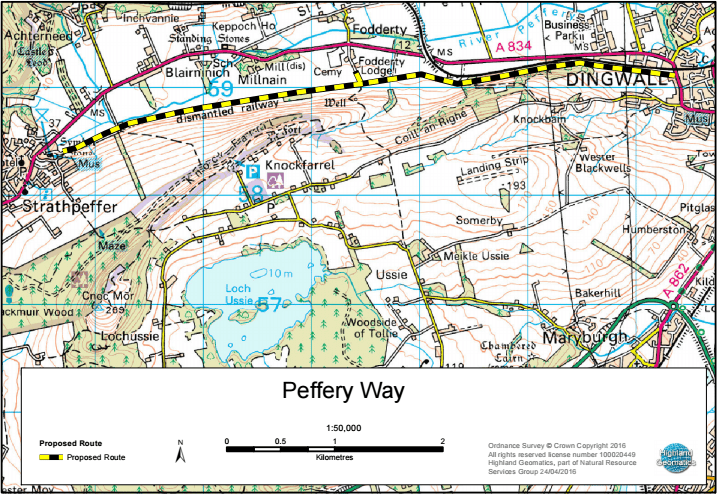 Around 8 years ago the Strathpeffer Community Council produced a feasibility study looking at the need for such a path. The study identified a preferred route but difficulty over access has meant that it has since gathered dust. Alternative routes have an increased cost and a steep incline so are less suitable for kids and wheelchairs. The purpose of the walk was to highlight just how keen the local community are for this link to happen and to encourage everyone to work together to find a mutually agreeable solution. One of the party who walks with sticks got stuck in the mud and fell over early on, so had to turn back. A perfect illustration of why a good quality path is needed. One of the families on the walk live in Fodderty but feel cut off without a car. The road is not walkable, especially with children and public transport is infrequent and costly. The route itself is beautiful, and a lot of it is well away from the main road. It would attract people to the area. It’s unusually flat for a Highland route so suitable for everyone. Cyclists could get off the train in Dingwall and get into the hills around Strathpeffer to mountain bike without going on the road and of course a fairly large population of both children and adults could use it to commute to work and school. There are bike shops at both ends so there would be the possibility of bike hire making it a real asset to tourism.